Accessory for dimming model ACC. 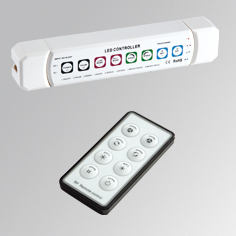 RGB RCONTROLLER 24V 432W, LAMP brand. RGB regulation controller type. Select a color, increase or decrease brightness and increase or decrease the rate of dimerization. Includes infrared remote control and 16 shift patterns. Requires 24V external power supply.